These two images are of the same part of the Taurus Molecular Cloud, about 450 light-years from Earth. 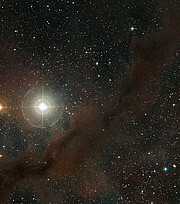 Its relative closeness makes it an ideal place to study the formation of stars. 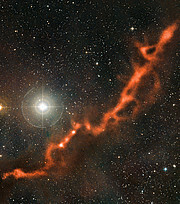 The images show how clouds of cosmic dust grains appear dark and obscuring when observed with visible light, but are seen to glow when observed with light of wavelengths around one millimetre. The millimetre-range observations were made with the LABOCA camera on the APEX telescope. The upper-right part of the dusty filament shown here is known as Barnard 211, while the lower-left part is Barnard 213.